The FDA hasn't banned the sale of cannabidiol oils because a drug company is interested in marketing them. The Food and Drug Administration (FDA) banned the sale of cannabidiol (CBD) oils because a drug company is interested in marketing them. In other words, the FDA just handed Big Pharma an absolute monopoly over CBDs (hemp oil extract) by ridiculously claiming such natural products are “adulterated” with molecules (CBDs) that the FDA says might one day become a drug. The relationship between digital articles and social media is such that a large share of the reading audience is exposed only to the headline of any given article and not its full text. One estimate from 2014 suggested that as many as four in ten people only read an item’s title, a figure which could be far higher when multiplied by Facebook. Thus, Adams’ claims led many to infer that the FDA had indeed issued an immediate, sweeping ban on CBDs (a product popular among chronic pain sufferers). The debate over hemp CBD’s legal status continues after FDA sent eight warning letters to manufacturers of CBD dietary supplement and food products earlier this month. The warning letters cite impermissible health claims used to market the products, as well as CBD’s invalid status as a dietary ingredient due to its presence in two drug applications currently under consideration. On February 4, FDA sent warning letters to eight companies marketing CBD foods and dietary supplements, partially on the basis of impermissible medical claims used in marketing materials. These include suggestions that CBD may be used to reduce symptoms of schizophrenia, rheumatoid arthritis, diabetes, cancer, multiple sclerosis, and more. This continues the FDA’s ongoing battle against unapproved CBD products. In April of 2015, the FDA issued six similar warnings to companies with varying amounts of CBD. The Federal Food, Drug and Cosmetic Act, otherwise known as the FDC Act, requires scientific information to demonstrate that a drug is safe. Pain Bomb allegedly violated section 201(g)(1)(B) of the FDC Act [21 U.S.C. § 321(g)(1)(B)]. The FDA gave Pain Bomb only 15 business days to correct all foregoing violations. In April 2015, the FDA sent warning letters to six companies whose products allegedly contained CBD. The FDA warned these companies about marketing and selling unapproved drugs to diagnose, mitigate, treat, or prevent diseases in humans or animals. The FDA sent out a fresh round of warning letters to eight new companies. The FDA’s February 4th letter to PainBomb, LLC about the company’s “PainBomb+CBD” products is representative of the letters, and it states … PainBomb’s websites and accompanying literature seek to sell drugs covered by section 201(g)(1)(B) of the Federal Food, Drug, and Cosmetic Act [(the “FDC Act”)] [21 U.S.C. § 321(g)(1)(B)] because they are intended for use in the diagnosis, cure, mitigation, treatment, or prevention of disease. PainBomb violated the FDC Act by misbranding its products. The diseases for which PainBomb marketed its products cannot be self-diagnosed or self-treated by people other than health care professionals. For this reason, PainBomb’s instruction labels informing users whether and how to use its products violate the FDC Act. 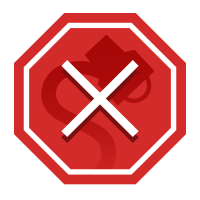 The claims on your websites establish that the products are drugs under section 201(g)(1)(B) of the Federal Food, Drug, and Cosmetic Act (the Act) [21 U.S.C. § 321(g)(1)(B)] because they are intended for use in the diagnosis, cure, mitigation, treatment, or prevention of disease. As explained further below, introducing or delivering these products for introduction into interstate commerce for such uses violates the Act. You can find the Act and FDA regulations through links on FDA’s home page at www.fda.gov. Although you market “Bluebird Botanicals Bulletproof CBD Blend,” “US Hemp Wholesale 25% CBD Hemp Oil Supplement” (aka “Gold Label CBD Hemp Oil”), “Plus CBD Oil,” “Endoca Hemp Oil,” and “Tasty Hemp Oil Tasty Drops” as dietary supplements, FDA has concluded based on available evidence that CBD products are excluded from the dietary supplement definition under section 201(ff)(3)(B)(ii) of the Act [21 U.S.C. § 321(ff)(3)(B)(ii)]. Under that provision, if an article (such as CBD) has been authorized for investigation as a new drug for which substantial clinical investigations have been instituted and for which the existence of such investigations has been made public, then products containing that substance are outside the definition of a dietary supplement. There is an exception if the substance was “marketed as” a dietary supplement or as a conventional food before the new drug investigations were authorized; however, based on available evidence, FDA has concluded that this is not the case for CBD. MAJOR CORRECTIONS: I’m issuing a huge correction / clarification to this story after speaking with people in the hemp industry. They’ve pointed out that my article, although posted with the best intentions to help keep CBDs legal and readily available, was freaking out CBD retailers who thought some sort of new law had been passed outlawing CBDs. In no way did I intend to disrupt CBD retailers with that article! My only goal was to sound the alarm of how to FDA is attempting to destroy this entire industry, and help create a backlash that would keep natural medicine legal in America. So I’ve decided to post a serious correction / clarification to this story to make sure nobody misreads what I’m asserting here, and I apologize for any misconstruing of my intention in posting this … Essentially, my use of the term “outlawed” in the title of my original article was misconstrued. By “outlawed,” I meant the FDA essentially writes its own “regulatory laws” and has posted a clear statement on its own website which states that CBDs cannot be sold as a dietary supplement. This is a regulatory attack on hemp extracts, but it is not technically a law that was passed by Congress. I regret my choice of the word “outlawed”, and I will be more careful in my choice of words when covering this issue in the future. In the article below, I have replaced any reference to “outlawing” with the more accurate terminology of “regulating out of compliance” or similar language. 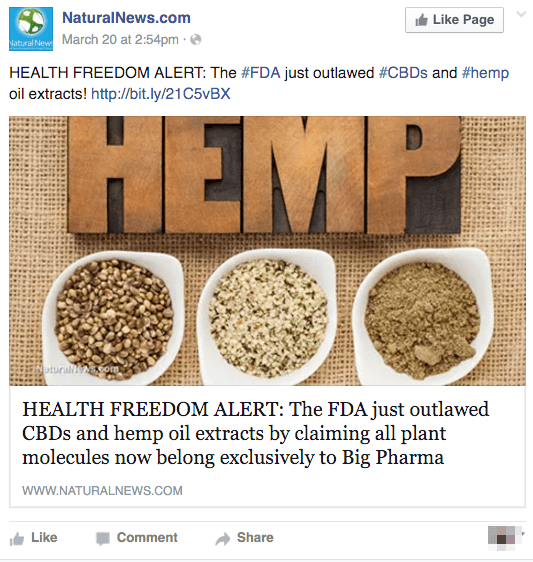 The FDA just outlawed CBDs and hemp oil extracts by invoking a totally insane regulation you won’t even believe. Because a drug company is investigating CBDs for use as a medication, the FDA now says it is illegal for CBDs to be sold in any dietary supplement. While the FDA did send letters to CBD oil manufacturers in February 2016, the letters addressed marketing and labeling claims that violated the FDC Act. In the letters, the FDA simply required that CBD oil manufacturers cease cited labeling and marketing practices, but didn’t “outlaw” the products nor demand the vendors withdraw their oils from the market. The wildly inaccurate representation wasn’t out of line with the untrustworthy content practices associated with Natural News. Prior articles published on that site asserted that welfare recipients would be forced to receive RFID chip implants, that Chipotle’s foodborne illness outbreaks were the work of pro-GMO bioterrorists, that doctors were responsible for more deaths than guns in America, that the Centers for Disease Control (CDC) issued a warning urging Americans not to get the flu shot, that a Johns Hopkins scientist blew the lid off the hidden risks of influenza vaccination, and (perhaps most bizarrely) that the government was engaged in a program to utilize aerosolized “thought control” vaccines on the population. All but two of these claims were advanced by “Health Ranger” Mike Adams.